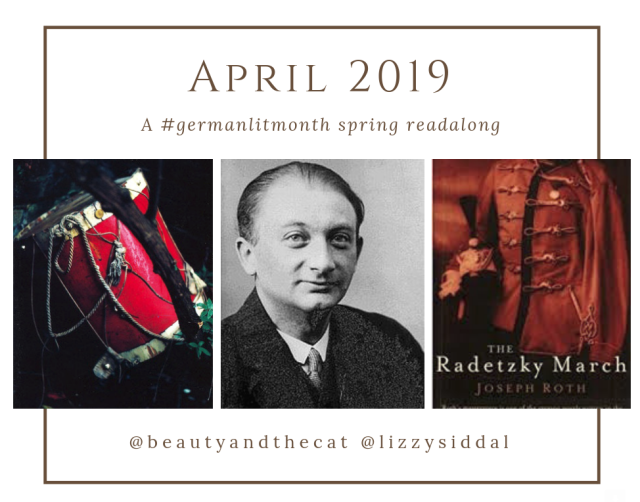 I have read a few books by Joseph Roth and have enjoyed them all but I hadn’t read his most famous novel, The Radetzky March, which is the only book by Roth to be included in Boxall’s list 1001 Books You Must Read Before You Die. The books by Roth that I have read are Hotel Savoy, The String of Pearls, The Hundred Days and, one of my favourite books, The Legend of the Holy Drinker. I’ll admit that The Radetzky March had never really appealed to me as much as Roth’s other books but when Caroline & Lizzy first made public their intentions I was reading Ring of Steel by Alexander Watson which was about the First World War from Germany’s and Austria-Hungary’s perspective and so I thought that it would be a good time to read a novel about the Austria-Hungaria military set prior to WWI. I am reading a Kindle version of the Granta edition translated by Michael Hofmann. I bought it back in 2014 from Amazon when they were selling it off cheap. I have no issues with the translation. Well, yes and no. It hadn’t appealed to me before as I’m usually reluctant to read military books; though in the past I have ended up enjoying some books, or sections of books, that have a military setting. The first chapter I really enjoyed but I felt that it read more like a self-contained short story than the opening chapter of a novel. I felt the next few chapters were a bit confusing as Roth jumps a generation to concentrate on Carl Joseph. I have now re-read parts of the book including the whole of chapters seven and eight and I’m enjoying it a lot more now. I’m now looking forward to Parts Two and Three a lot more than I was. The opening lines almost summarise the whole of the first chapter but hides enough to make the reader intrigued to find out more. I always like opening lines that draw the reader in. I thought they were effective. When the elder von Trotta discovers that the story of him saving the Emperor’s life has been used for propaganda purposes he feels as if he has been cheated of the truth. No-one he talks to can understand his level of indignation over this but it is enough for him to leave the military and move away. When he objects to this mythologising of this part of his life he just receives more honours. His faith in Emperor and Empire appears to be broken. His descendants, however, appear to accept their place amongst the aristocracy without question but this places a burden on them, and especially on Carl Joseph as he embarks on a military career, to constantly live up to the example set by the Hero of Solferino. Carl Joseph doesn’t seem to know quite how to behave. He doesn’t know how to talk to his servant, as he suspects his grandfather would have. He doesn’t feel comfortable with the other officers as he doesn’t share their enjoyment of drinking, womanising and playing cards. The military life in peacetime seems meaningless as he is denied the possibility of matching his grandfather’s achievement. It is not clear whether Carl Joseph was romantically involved with Frau Demant: Demant’s father-in-law tells Demant that Carl Joseph was with his wife but Demant wants to believe that nothing is going on— Demant does not want to know the truth, whereas Baron von Trotta insists the truth should be told. Early on in the narrative everything suggests that Carl Joseph and Frau Demant’s relationship is not platonic. But once the duel has been declared Carl Joseph states that he was just escorting Frau Demant home on the night in question. This could be true but that does not mean that there was nothing going on between them before, or Carl Joseph could be dissembling. It is not clear why Demant left his wife at the theatre during the Second Act. As Strauss’s Radetzky March is jubilant and triumphant I can only assume that its appearance throughout the novel is ironic. As it has a military history it is relevant to Roth’s story. Female characters are noticeable by their absence. A novel about the military is going to be mostly about men but the wives and mothers of the three von Trotta men are barely mentioned at all and there is no mention of sisters, aunts etc. I don’t think Carl Joseph’s mother is even mentioned; it’s as if male begets male. Carl falls in love with Frau Slama at an early love and doesn’t seem to get over her but one wonders if that is because she is the only female he has any contact with. Frau Demant is probably the most prominent female character in the first part. I initially struggled a little with my reading of The Radetzky March but I’m coming round to suspect that the trouble is with me. I sometimes find it difficult jumping from one author to another especially when their styles differ which is what happened here as I went straight from reading L. P. Hartley to Joseph Roth. I was also expecting the novel to progress slowly through the generations but instead it jumped from grandfather to grandson which was unexpected. I have sometimes found the narrative to be deliberately misleading but I’m getting used to Roth’s style—I don’t recall his other books being difficult in this way. In writing this post I have re-read several sections and the whole of chapters seven and eight and realise there was a lot that I missed which I put down to reading large portions of the book under ‘hostile reading conditions’, i.e. noisy and disjointed. I’m looking forward to advancing to Part Two. I loved the beginning of Chapter Eight where Roth compares the years before and after WWI—Vishy quotes the whole section in his post. Yes, Roth & Zweig—I can’t get enough of them. I have the Collected Novellas of Zweig that needs to be read. Beautiful post, Jonathan! I loved what you said about how the book talks about some of the apparent privileges that aristocrats have and the duties they have to perform. Glad you liked that passage at the beginning of chapter 8. So beautiful, isn’t it? It wasn’t until I read the opening pages of chapter 8 that I realised this book was better than I thought. Re-reading parts has slowed down my progress but has been very useful. Glad to know that, Jonathan! The beginning of chapter 8 is so beautiful, isn’t it? Glad you are re-reading it. I can’t stop reading that particular passage! I like your insight into the tension between rights and duties, Jonathan. It’s a good way of capturing something I had been struggling with: the privilege of these people’s lives, and yet the sense that they are trapped and constrained at every turn. Your description of “hostile reading conditions” made me smile too—I was lucky to read this one in friendlier conditions, but I’ve had other reading experiences in which I felt I had done a book a disservice by reading it in snippets on trains when I couldn’t really concentrate. Thanks Andrew. Having just finished Part Two I feel that Carl Joseph feels even more constrained by his past than in Part One. It’s interesting to see Carl and others trying to live up to this idealised version of his grandfather. Carl has to compare every action that he does with the one noble deed by his grandfather—it’s doomed to fail, I guess.